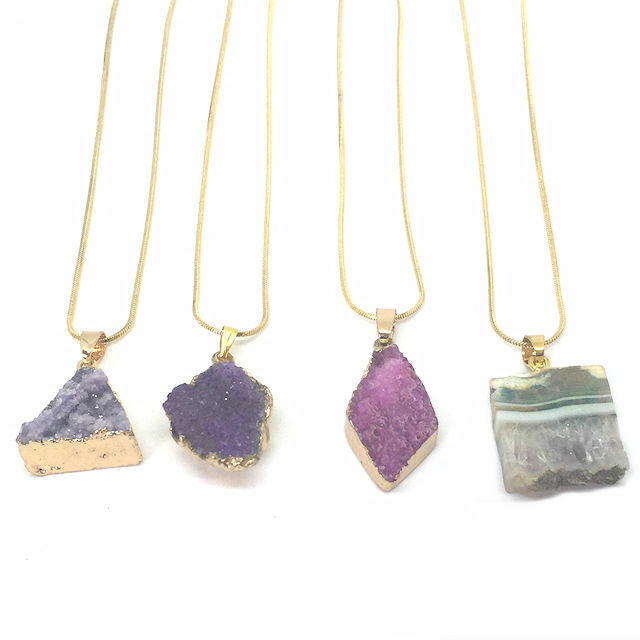 The Spring Meadow Necklace is a gorgeous and unique druzy quartz crystal pendant on a quality gold filled chain. This item has been lovingly handcrafted in our studio as part of our Healing Crystal jewellery collection. 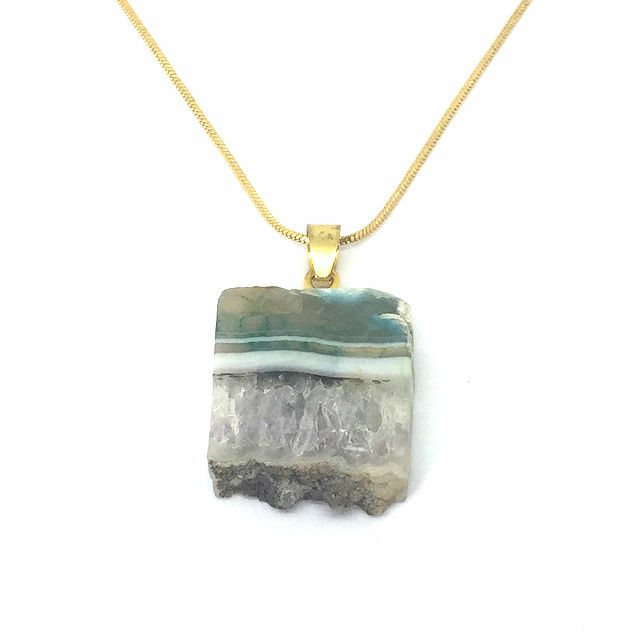 The necklace measures approximately 18″ with the druzy quartz crystal measuring approximately 1″. Customised sizes are available upon request. The Spring Meadow necklace features a charming square shaped green and clear white druzy quartz crystal centrpiece. 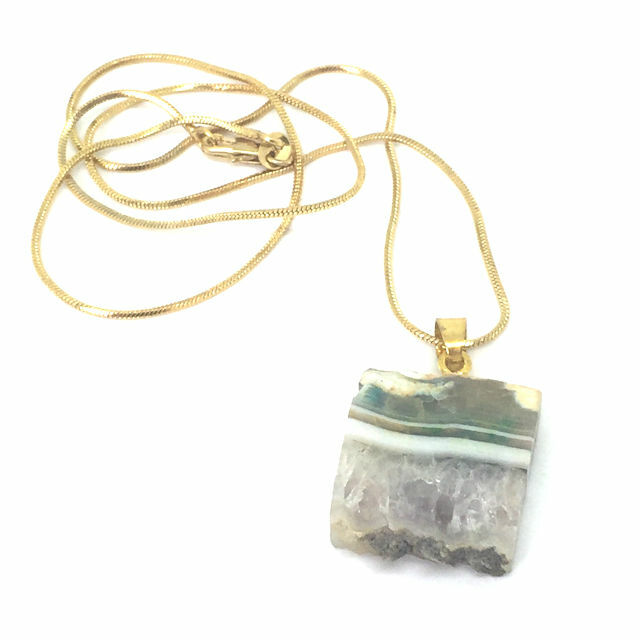 The necklace measures approximately 18″ with the druzy quartz crystal measuring approximately 1″. Customised sizes are available upon request. This item comes with a high quality gold filled chain and lobster clasp. Gold filled chains are made with solid gold, from between 50 to 150ml of ‘solid’ gold mixed with other alloys of metal. Gold filled is an exceptional alternative to ‘solid’ gold and is extremely durable lasting up to 30 years even with daily wear. The Spring Meadow necklace features a charming square shaped green and clear white druzy quartz crystal centrpiece. Did you know? The term ‘quartz’ derives from the Greek word ‘krustallos’, which means ‘ice’. Named so, as it was believed that quartz was in fact ice formed by the Gods. Handcrafted artisan jewellery that is as individual as you!